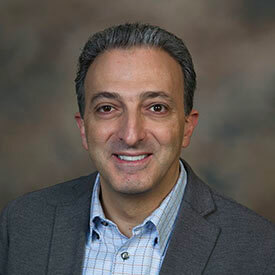 Dr. George Salti is a surgical oncologist with extensive experience in cytoreduction with heated intraperitoneal chemotherapy (HIPEC). This treatment combination has proven effective for peritoneal mesothelioma. Salti practices at the University of Illinois Hospital in Chicago, serving as an associate professor of surgery. He also is director of surgical oncology at the Edward Cancer Center in nearby Naperville, where he has worked since 2013. Salti has been performing the cytoreduction/HIPEC procedure for abdominal cancers since 2001 – longer than anyone else in the Chicago area. His expertise offers hope to dozens of patients who qualify for the procedure each year. The procedure combines surgery with a heated chemotherapy wash of the abdominal cavity to eliminate both visible tumor growth and microscopic cancer cells. The challenging procedure has gained acceptance in recent years as the most effective tool against certain abdominal cancers, including peritoneal mesothelioma. Some mesothelioma survivors, who once were expected to live less than 18 months after diagnosis, are living five to 10 years and beyond. The procedure is used most often with colorectal or appendix cancers. It also is used with certain types of ovarian cancer, gastric cancers, peritoneal carcinomatosis and mesothelioma. Salti is one of the few surgeons in the state who treats late-stage cancers with HIPEC. He also helped establish a HIPEC clinical data registry at the Edward Cancer Center. It tracks patients through the rest of their lives, collecting data to continue improving the procedure. Salti worked previously with University Surgical Consultants. He graduated from the University of Chicago Pritzker School of Medicine, and he did his residency and fellowship at the University of Illinois Medical Center at Chicago. He is certified by the American Board of Surgery. He is a member of the American Hepatobiliary Pancreatic Association, American Society of Peritoneal Surface Malignancy, American Society of Breast Surgeons, Society of American Gastrointestinal Endoscopic Surgeons and Society of Melanoma Research. Disclaimer: Dr. George Salti has no professional affiliation with Asbestos.com. I would like help getting in contact with this doctor and other mesothelioma specialists about my treatment options. UI Health. (n.d.) George I. Salti, MD.